Last update on Sept. 11, 2017 . We've been heads down for the past few months adding almost 20 new premium features to MorphMarket. This is the first of a series of blogs to highlight the additions. Today we will share enhancements to ad information. For each new field we've indicated in square brackets which seller membership levels the feature is applicable to. 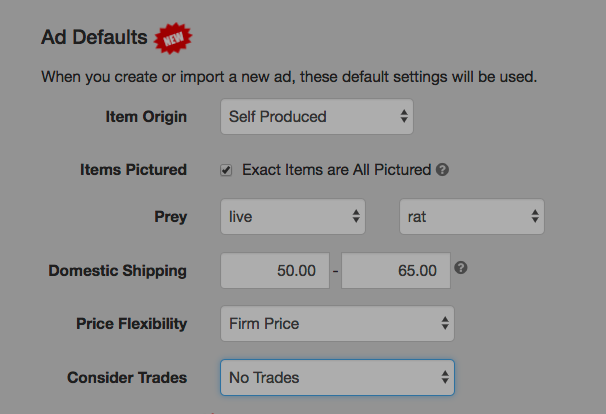 Sellers can now configure default preferences for ad fields with Ad Defaults. Near the bottom of your Store Profile, you can set defaults for many of these new fields (as well as Prey Food) which will be pre-populated into new ads being created or imported.